So Can We Vacation in Space Yet or What? 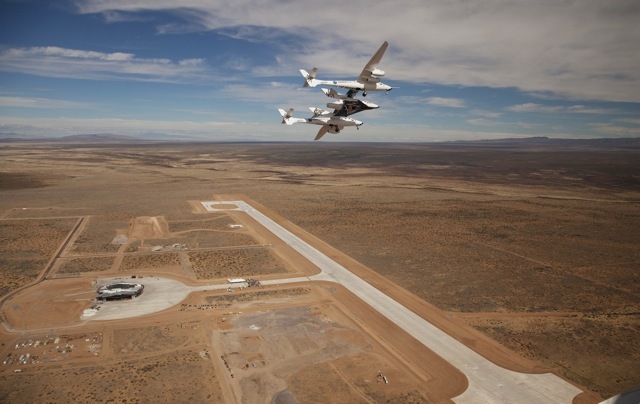 Virgin Galactic’s VSS Enterprise and VMS Eve mother ship fly over Spaceport America (near Truth or Consequences, New Mexico). Photo by Mark Greenberg, courtesy of Spaceport America. What ever happened to space tourism? Weren’t commercial spacecraft supposed to make it so regular celebrity multi-millionaires like Lance Bass could experience the wonders of low Earth orbit? Well it’s been seven years since Scaled Composite’s SpaceShipOne claimed the Ansari X Prize for the first privately funded, repeatable manned space flight, and the genial bass vocalist is still waiting for his chance to sail skyward. Late last week, a diverse group of students, teachers, travel agents, and space industry professionals clustered around a conference table roughly the size of a small football stadium in Commerce Park, to discuss the future of civilian space flight. According to Virgin Galactic VP of special projects Will Pomerantz, who joined the gathering via a tabletop speakerphone pod, viable commercial space tourism is not a distant dream. His company has already pre-sold tickets to 215 would-be astronauts (and processed bookings for 17 Canadians)—a number which sounds more impressive when you consider that only 517 people in history have ever been to space. For the relatively low but also heart attack inducingly high price of $200,000 US, clients will soar to a maximum altitude of 110 km, 10 km beyond the Kármán line commonly used to define the boundary between Earth and space. They will experience roughly 4½ minutes of zero gravity, during which there will be ample opportunity to take in the God’s-eye view. So far, the Virgin Galactic “fleet” only consists of one spacecraft, which is based heavily on Scaled Composite’s Ansari X Prize winning design. The VSS Enterprise, as it’s been dubbed, is still undergoing testing, but the company has plans to build an additional four models. Virgin Galactic also hopes to bring the price point down to somewhere around the cost of an SUV. The timetable for this, like the target date for the company’s first commercial flight, is still pretty fuzzy. So it’s safe to say you and I are not going to be visiting space for at least a few more years. But there are good reasons why Canadian space scientists and professionals are keeping a close watch on companies like Virgin Galactic. According to planetary scientist Alan Stern, the international space station “has tremendous capability, but it will always be limited to just the few people there, and it takes years to prepare things to go up.” Commercial space flight, on the other hand, promises to do things faster and cheaper. Pomerantz spoke of running three flights a day out of the company’s spaceport near Truth or Consequences, New Mexico. It will also let scientists themselves accompany their experimental payloads. When Pomerantz announced that Virgin Galactic had recently pre-sold tickets to its first group of researchers, the scientists in attendance pressed him for details. Will they pay the same price as tourist passengers? They will. Are there any Canadian funding mechanisms in place to support the hefty fare? None that he was aware of. 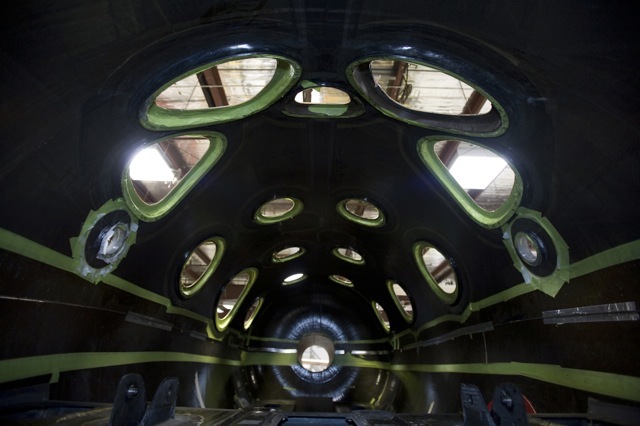 The unfinished interior of a Virgin Galactic spaceship. Photo by Mischa Varmuza, courtesy of Virgin Galactic. NASA’s Space Shuttle fleet is scheduled to be decommissioned this year, which will leave the agency without endogenous means to send astronauts to space. President Obama is hoping that the private space sector will step in to fill this void, and NASA under his administration has recently doled out $269 million in commercial contracts to kick start this effort. The Canadian Space Agency has no spaceport of its own, and relies heavily on the launch capabilities of NASA. So as NASA begins to scale back its operations, it doesn’t take a—um—rocket scientist to figure that Canada is going to have to come up with new ways to get stuff into space. Sending astronauts and payloads on commercial flights is one way for the country to maintain a space presence. According to Chuck Black, treasurer of the Canadian Space Commerce Association (CSCA), which organized this event, Canada needs to do more to promote its own commercial space sector, which reportedly generates over $3 billion in business revenue a year. “There are…corporations,” says Black, “doing useful things in space in Canada today, and we’re ignoring them.” The CSCA formed in part to combat a widely held assumption among investors and professionals that all the important work in the industry is taking place stateside. “We have options here in Canada,” Black asserts, “we don’t have to have people go to the States in order to work in this industry.” And the subtext of Thursday’s talk was that an open market for space flight will help Canada make better use of homegrown innovation. So there you have it. The price of civilian space travel has dropped to the point that ordinary stinking-rich people can afford it, scientists are booking flights on space pleasure-craft, and Canada is figuring out how to lay claim to its own slice of the commercial space pie. But what about billionaire playboys? How will they still get to feel special about themselves? The Virginia based space tourism firm Space Adventures is already planning a lunar mission for 2015. Tickets start at $100 million.